And another Monday rears it's head again. The weekends go by oh-so-fast these days. I'm kicking off this gloomy NYC day with a menswear-ispired look... suspenders, over-size jeans, loafers and all. I have a feeling I'll be rocking these jeans quite a bit this fall. Anyway...hope you are all having a great start to your week so far! love this outfit. I'm a huge fan of ripped jeans! Love this! Those suspenders are so cute!! Really really great outfit and pictures! Such a gorgeous look - comfortable, stylish & effortless! Your hair and make-up are stunning too. your style is so cute, and i love it. good pictures and good outfit. I literally said "Ooh" when I saw this outfit! LOVE! Amazing outfit, I really love your shoes! This has me craving a pair of suspenders - so cute! You even look so pretty in boyish outfit!! Just discovered your blog love your style & pictures! Check my blog out, i make my own clothes & take pictures of my style. such a cutie! love the suspenders and that bag! Love the loafers! They give a chic touch. this outfit is adorable. i'm currently on the hunt for the perfect boyfriend jean! So cute! I love the look of worn in jeans with suspenders and it looks awesome on you. 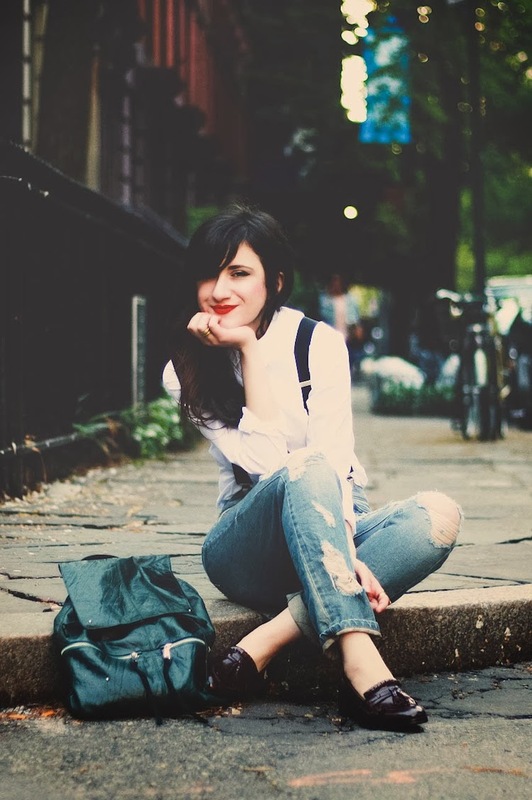 A boyish outfit with chic red lipstick is so pretty! you look great, as alweys! You're so cute! The outfit is simple yet it came out so pretty. Love the outfit! Simple yet cute. 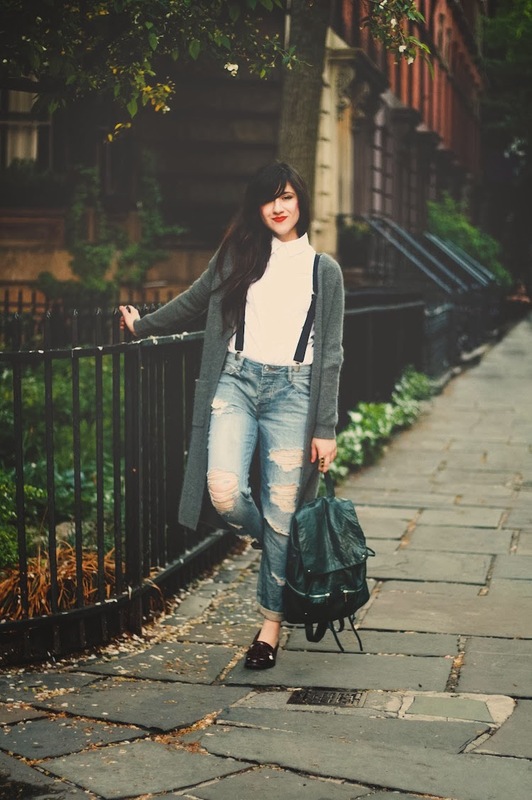 This look is perfect for you and I am sure you will wear it a lot since suspenders make an outfit stylish and comfy at the same time. Such a cool outfit! The cardigan adds an extra amount of cozy to it and the red lips still keep everything feminine.